My circle of friends includes more than a few grad students, but few of them seem very happy, especially those who've already put every part of the process behind them except their dissertation. As they struggle to wrestle that daunting beast to the ground, I — as a non-academic — try to provide whatever perspective I can. To my mind, a dissertation, just like any other major task, demands that you break it down into small pieces and frame each piece in your mind just right, so I naturally think Nick Sousanis made the right choice by writing his dissertation, panel by panel, frame by frame, as a graphic novel. 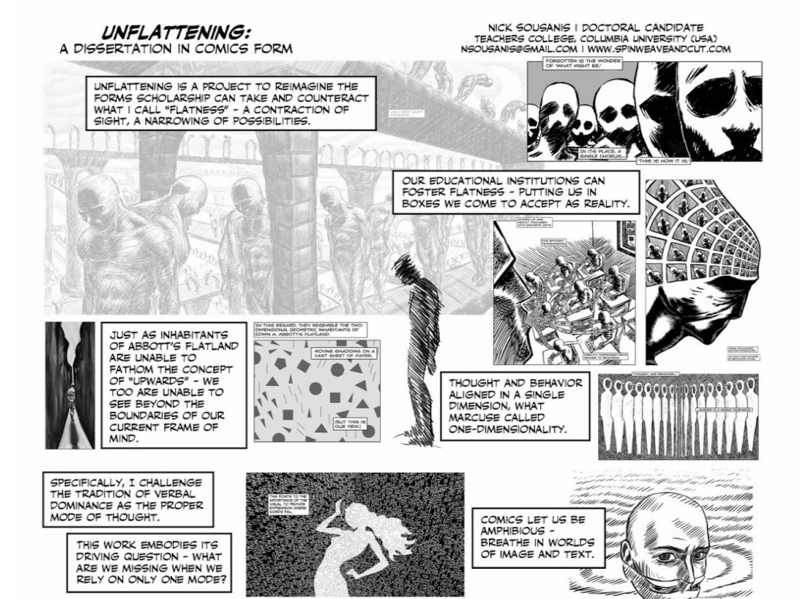 Boing Boing's Cory Doctorow recently wrote about Unflattening, Sousanis' "graphic novel about the relationship between words and pictures in literature" that doubled as Sousanis' dissertation in education at Columbia University. Doctorow quotes Comics Grid's Matt Finch, who describes the work as one that "defies conventional forms of scholarly discourse to offer readers both a stunning work of graphic art and a serious inquiry into the ways humans construct knowledge." Uniting the perspectives of "science, philosophy, art, literature, and mythology, it uses the collage-like capacity of comics to show that perception is always an active process of incorporating and reevaluating different vantage points." A bold claim indeed, but one you can evaluate for yourself by reading the fifteen-page excerpt of Unflattening now available for free, or purchasing your own copy of this groundbreaking dissertation online. It will give you an idea, making reference along the way to astronomy, ancient Alexandria, modern Manhattan, Gilles Deleuze, Sousanis' dog, Ulysses, Buddhism, and the medium of the comic book — or the graphic novel, or sequential art — itself. You can find out more about this impressive work of art, scholarship, or however you prefer to regard it at the Harvard University Press site or Sousanis' own. The video just above, on an exhibit of work from Unflattening, features Sousanis talking about his experience in this "amphibious medium."